SCVHistory.com LW2950 | Lebec | Postal Cover 1980: 50th Anniversary of Lindbergh's 1930 Experimental Glider Flight. 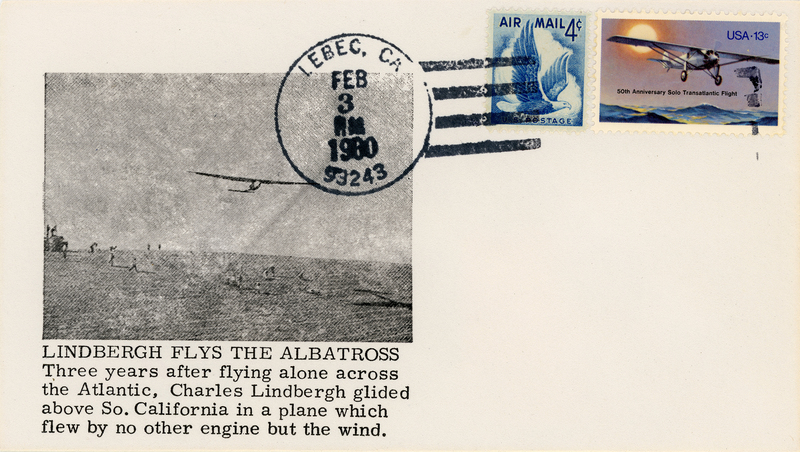 Commemorative postal cover marking the 50th anniversary of aviator Charles Lindbergh's flight tests of an experimental glider in Lebec. Postmarked Feb. 3, 1980, at Lebec, CA 93243. Postage stamp (13c) commemorates Lindbergh's 1927 solo flight across the Atlantic Ocean. Front reads: Lindbergh Flys [sic] the Albatross / Three years after flying alone across the Atlantic, Charles Lindbergh glided above So. California in a plane which flew by no other engine but the wind. Back stamped: TOP-i-CO / Limited Edition / No. 68 of 75 Covers Serviced. LW2950: 9600 dpi jpeg from original cover purchased 2017 by Leon Worden.